Go retro with the boxiest appliance on your musthave list. Igloo’s sleek mini fridge includes a freezer compartment, a door basket that holds two 1-liter bottles, and a side-mounted stainless steel bottle opener. When natural light is scarce, “having something to brighten your room besides the awful fluorescents is crucial.” Try draping this 100-foot string of industrial-chic LED lights over your bed, or display them coiled in a glass jar. Just because your classmates are in PJs doesn’t mean you should look like you just rolled out of bed. “Luckily, that doesn’t require any actual ironing skills”—if you have a steamer that upgrades your look with a few quick swipes. Sometimes, the best furnishing choice for a dorm room is one that helps you escape it. 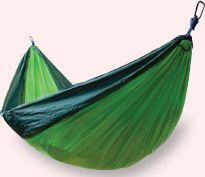 This two-person hammock made from parachute nylon comes with handy tree straps and packs down into a small sack.